Applications: Drawer Type Wet Tissue Packing Machine is on the base of Pillow-Type Packing Machine which has been designed and developed after technology innovation. It adopts PLC programmable controller to control packing production process of drawer type wet tissue and put several wet tissue into the film packing bag. The frontispiece bag has drawer mouth and encapsulated by envelope-page. When using please lift the envelope-page and take out wet tissue from drawer mouth, then cover the envelope-page and agglutinate again so that the inner wet tissues are still kept humidity. Drawer Type Wet Tissue Packing Machine has novelty structure, advanced technology, high production efficiency, and pollution prevention which may be caused by hand packing. The outer casing of the whole machine and the parts contacting the machine and products are all made of stainless steel and innocuity materials which accord with national standard requirement. The wet tissue products packed by this machine are cleanness, sanitary, afewhich are widely used for service trade such as eating, drinking and touring moreover it's suitable for airplane, train, ship use, easy for taking. 1) The drawer hole punch mould and envelope-page agglutination devices have been designed first of all, this technology has original creation in China. 2) A speed adjusting heat-sealing cutting hob has been designed first of all, one hob for several use which greatly improves production efficiency, reduces production cost. 3) Adopts advanced PLC computer program to control, photoelectric detecting sensor to detect the color mark, photoelectric color mark detection, two-way compensation, thus making color mark detection quick and accurate. 4) Every heating part adopts four temperature controllers to automatically control temperature, thus improving the quality of sealing. 5) The drawer mouth adopts adhesive tape agglutinate, prefect encapsulation capability, easy for opening and closing. Looking for ideal Drawer Type Wet Tissue Packing Machine Manufacturer & supplier ? We have a wide selection at great prices to help you get creative. 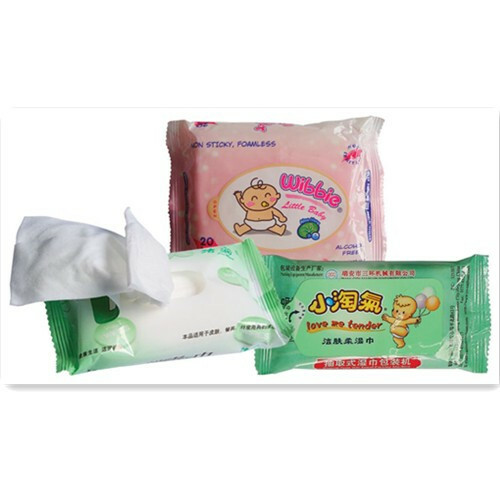 All the Multi Pieces Wet Tissue Packing Machine are quality guaranteed. We are China Origin Factory of Horizontal Packing Machine. If you have any question, please feel free to contact us.